Model of LED runway lights and markings. This diagram explained how does the airport runway lights works, their color and where are located. 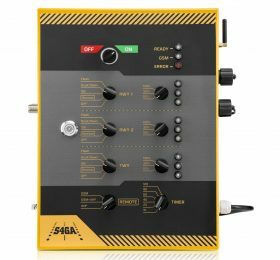 S4GA airport runway lights is a complete alternative to conventional/wired AGL system. It is ICAO compliant off-grid airfield lighting with individual light control and monitoring. Each element of the system is connected with others via wireless mesh network. 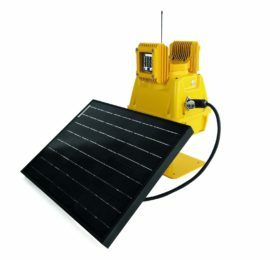 The key element of solar-powered airport runway lights is SP-401 elevated light. SP-401 has in-built battery with capacity of up to 85 hrs of operations. 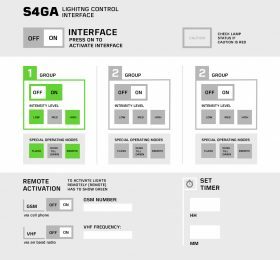 S4GA uses LED as a source of light as it has significant advantages over conventional incandescent lights. LED is protected by premium glass dome. 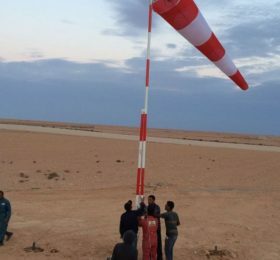 Today solar airport runway lighting is used in most cases as a temporary solution: during repair works on the main RWY lighting, as portable aerodrome lights on small private airfields, etc. S4GA solar powered runway lighting system is the first in its class lighting which can be used as primary/ fixed application because. We use independently installed solar panel which allows generating 4-x more electrical energy compared to solar panels inbuilt in the walls of lights. As a result, the battery in airfield light charges faster. S4GA runway edge light provides 1.500 cd of light output – so far there is no solar aviation light on the market which can provide even close amount of light. We use non-licensed 868 Mhz for wireless communication. Some of other AGL manufacturers use certified frequency of 900 Mhz which requires special approval. For better understanding how does our solar runway lighting system works please read our description below. You will know how does the runway lights works at night, we will explain colors, meaning and standards of model airport runway lights at diagram. When looking at runway lights at night, one can assume that they are only used for illuminating the most important part of an airport. Quite the opposite. Runway lighting colors, intensity and type can navigate a pilot so as the landing operation is safe. 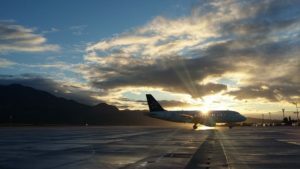 So what types of airport runway lights are there? What do the particular runway lighting systems mark? And finally, what’s the meaning of runway lights for a pilot? You will find answers to these questions here. We’ll also take a closer look at solar runway lighting – is there a future in it? A runway is equipped with a few types of lights. First and foremost, there are runway edge lights. Threshold lights accompany them. 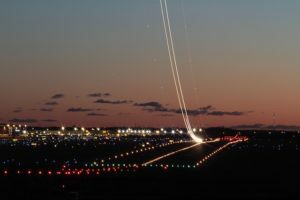 Moreover, most of the airports worldwide have Runway End Lights (End of Runway Lights), Approach lighting systems (ALS) and Wind direction indicator lights. A pilot operating an aircraft on the ground of an airport is also directed by a system of signs, but this is a topic for a separate article so we won’t spend more time on it today. This is about runway markings, what’s more? While discussing airport lighting, solar lighting cannot be skipped out. Even though the conventional lighting is still used at most of the airport, solar systems are gaining in popularity. They are not only equally reliable but also cheap and easy to install and maintain. Additionally, solar-powered runway lights are utterly irreplaceable at remote airports with hindered electricity access or no access at all. Runway edge lights are installed on both sides of a runway, symmetrically with its centerline. On an instrument runway, the lights are put at 60-meter intervals; while on a non-instrument runway, they are put at 60-meter intervals. Runway edge lights include white, constant lights. When it comes to instrument runways, in the middle of such a runway (or for the last 600 meters, depending on which distance is shorter), yellow lights are installed. They inform about approaching the end of a runway. To illuminate runway edges, high-intensity lights (HIRL), medium-intensity (MIRL) and low-intensity lights (LIRL) are used. As already mentioned, runway edge lights occur in tandem with threshold lights. But there are two exceptions. These are non-instrument runways and non-precision approach runways where a displaced threshold and wing bar lights are used. Threshold lights are installed on both ends of a runway. They are installed in a threshold line, no more than 3 meters behind a runway end. The number of lights and the intervals between particular lights depend on a runway category. Nevertheless, they are always one-directional, green lights. Runway End Lights help a pilot to identify both the beginning and the end of a runway. It is particularly important if a runway is poorly visible – for instance if there are neighboring lights around. Green lights are installed in the point an aircraft starts landing. Red lights occur in the place the landing operation should end. Runway End Lights are installed in common cases with threshold lights. Approach lighting systems consist of light lines installed as a prolonging of a runway. They can start 900 meters from a threshold. 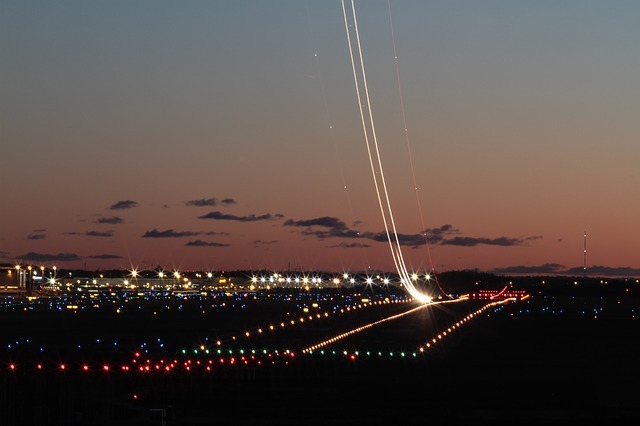 Currently, three types of approach lights systems are used at airports worldwide. The first one is a British CALVERT, which is used in Europe. The second one is an American CALVERT, which is used in the United States of America. Apart from these two, we also have military systems. Approach lights are sometimes installed far away from an airport. They are put in special, fragile masts which will break in the event of a collision with an aircraft and prevent any damage. The PAPI lighting system (precision approach path indicator) navigates a pilot into the approach path. 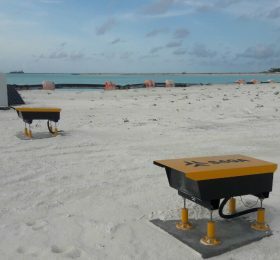 It consists of four lights installed on both sides of a runway. How does it work? Light beams are calibrated so as the pilot sees a particular number of lights (and number) which correspond to the altitude the airplane is on. Four white lights mean that the airplane is too high. Three white lights and one red – the airplane is a bit too high. Two white and two red lights – the airplane is in the approach path. One white and three red lights – the airplane is a bit too low. Four red lights mean that an airplane is too low in relation to the approach path. A wind direction indicator informs a pilot not only about the wind direction but also about its power. The so-called sleeve starts to move when the wind speed reaches 6 km/h. If it exceeds 28 km/h, the sleeve will fill in with air, which makes it take the shape of a high cone. Wind direction indicator lighting consists of spotlights. Low-intensity, obstruction lights can be put at the peak of a wind direction indicator. Airfield lighting control and monitoring system allows the control tower to operate the lighting. However, these days, state-of-the-art systems take a step further. A good example is a solar airfield lighting control and monitoring system. Both control and monitoring are handled remotely. It includes each and every lamp and the work of the system as a whole as well. Moreover, different work modes and three or five light intensity levels can be chosen. The activation and deactivation of the entire system can be done via radio or a phone call. Last but not least, we should also mention the lightbulbs that are used in solar (but also conventional) runway lighting systems. The moment the LED lightbulbs appeared on the market, they created new possibilities for solar runway lighting. The lifetime of such lights is very long (up to 50 000 hours!). Most importantly, they provide a proper light intensity and color, which, as indicated, is crucial for aircraft navigation.